It’s not always easy to be a hockey fan in the United States, isn’t it? ESPN doesn’t lead off Sportscenter with hockey highlights. The newspapers don’t have page after page of NHL coverage. Even the sportsbooks in Las Vegas don’t make a big effort to promote NHL hockey betting, especially if the NBA, MLB, NFL or college sports are in season. So if you’re an American who wants to do hockey betting, it can be difficult to find a sportsbook that caters to your needs. But fear not. There are still a few sportsbooks that offer excellent NHL betting options to those of us in the Land of the Free and the Home of the Brave. Nevada’s our favourite state to visit because it’s home to so many massive sportsbooks, all of which offer NHL betting. You can bet on that night’s games with cash, and it’s a popular place to do Stanley Cup betting on the futures odds as well. A few Las Vegas sportsbooks stand out as the best American NHL sportsbooks because they’ll put a lot of games on TV, while at other sportsbooks you might have to ask them to put a game on for you. We’re planning to visit Vegas again soon to do a review of the best Las Vegas NHL sportsbooks – tough job, but someone’s got to do it, right? No other states have sportsbooks that offer NHL betting, though there’s always talk that sports betting will soon be legalized in the United States. We can’t wait for that day to come, but until then, the only place for you to bet NHL other than Nevada is with online sportsbooks. Excel at NHL Betting Options – Any sportsbook that makes this list needs to have a solid NHL section on their site and, in general, have lots to offer hockey bettors here in the U.S. That could mean better than average odds, lots of prop bet options, great hockey live betting, etc. Allow Americans to wager in U.S. currency – This isn’t usually a problem with online sportsbooks, since U.S. currency is king. But if you’re playing with a foreign sportsbook, you’ll want to make sure you’re funding and withdrawing your money in American so that you can avoid paying foreign exchange fees. All that does is cut into your profits. Offer popular deposit and withdrawal methods – Sportsbooks on this list need to offer solid funding options for Americans or just make it easy for Americans to deposit with their credit cards. So which sportsbooks out of the thousands online do the best job of offering NHL sports betting in the United States? Two of them stick out above the rest. 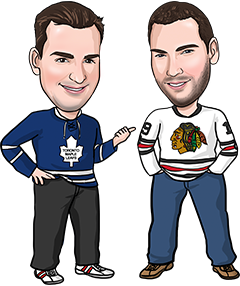 Which one is best for you depends on your specific needs – be sure to check our detailed NHL sportsbook reviews for US players for more info. Below are some reasons we like these particular bookmakers. Bovada tops the list of our best American NHL sportsbooks because it focuses so much on NHL betting. That’s probably because it’s an extension of Bodog, which was founded by a Canadian. Whatever the reason, Bovada offers tons of props in addition to the standard NHL betting lines, and has great NHL live betting options too. Bovada also gives Americans a sweet 50% cash bonus on your first deposit, up to $250. There are two huge reasons to love BetOnline: Odds and Bonuses. We’ll start with Bonuses first, because BetOnline will give you a 25% bonus every time you deposit money, not just on your first deposit. Their Odds are also among the best in the industry, and they’re often the first sportsbook to post opening NHL betting lines, allowing you to make bets before the oddsmakers make adjustments.